As for restaurants in general or practically any product, there is old school, new school and middle school so to speak. Two bar establishments in Toronto illustrate well the old and the new. Bar Volo has been in business about 30 years, but its craft beer focus is more recent. Initially it was an Italian restaurant, but about 12 years ago it started to focus on quality beer, in the process becoming both standard-bearer and bellwether for a recherché beer scene. Its bar is strictly craft, Ontario-focused but with the odd, well-chosen selection from Quebec, B.C., or elsewhere. Yesterday I noticed Cantillon Vigneronne on draft and had a go, well worth it, it was. It’s not every day you can sample artisan Belgian brewing so far away, en très bon état, il faut signaler. The rhubarb, winy and lactic notes of lambic have a strange attraction after the initial “sour shock”. As the offering is special even by Volo’s standards, the serving was just five ounces but well-worth the experience. I got down a Sawdust City pale lager after – good of its kind, typical German helles-style. Two different European styles, one a rare historical survival, the other a crafted interpretation of the international beer vernacular. 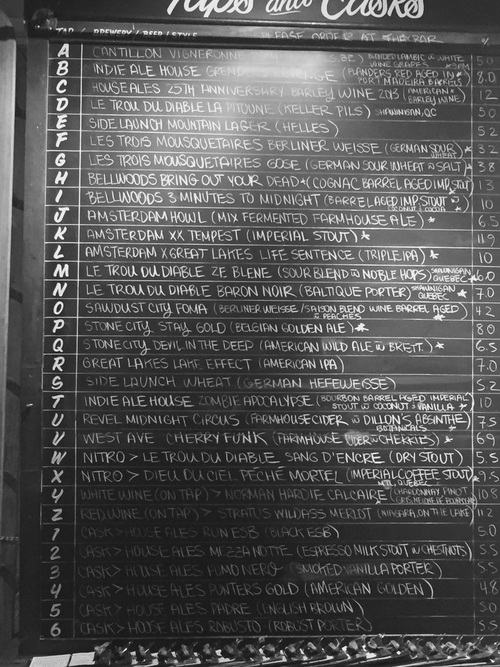 Bar Volo has the hottest and coolest beer selection going including a creative, import-focused bottled list. Sour/wild, farmhouse and flavoured beers are much of the moment, many singular and of gastronomic interest. These are frequently featured on Volo’s lists, but far from exclusively. To boot, Volo’s in-house nanobrewery, House Ales, always has offerings on the board, often a cask ale or three. The generally younger crowd are wowed by all this and so they should be. Walking south on Yonge Street after, just before entering the subway at Dundas, I happened to see Imperial Pub’s sign. This is an old Toronto watering hole, and I realized I’d never gone in. Why not, eh? The interior is paneled in medium-brown wood planks, with a large circular bar in the centre. I’d guess the wood is a 60’s-70’s re-modelling as the bar was established in 1944. Booths and other seating, utilitarian as suits the beer aesthetic, ring the room. The outside is an anonymous kind of brick, whether the original construction I can’t say. 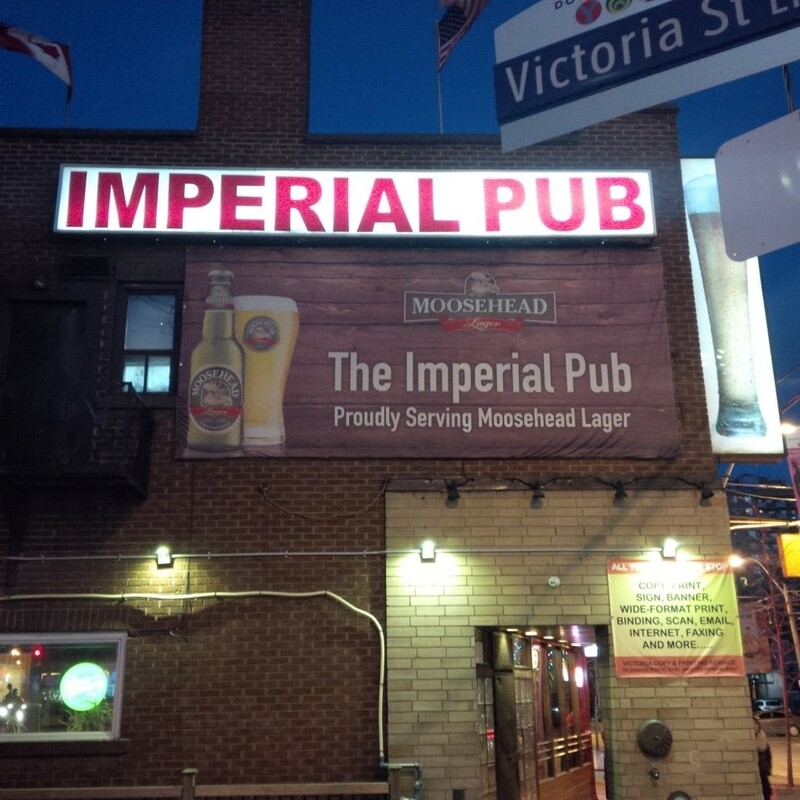 The Imperial offers beers from Moosehead, the industrial brewing stalwart from the Maritimes, but also carries beer from craft brewer Ste. Ambroise in Montreal, in which Moosehead has a stake. There are a couple of imports too, Grolsch of Holland is one. I had a pint of Ste. Ambroise Oatmeal Stout. The friendly server offered free house popcorn, which went well with the fresh and creamy black beer. The Imperial represents a disappearing genre of tavern, but is still going strong and has resisted the tide of redevelopment. The beers are served, incongruously to my mind, in dimpled English pint glasses. I’d guess in the 70’s the bar took on an English pub image, maybe the glassware was part of it. These mugs were once quite common in Toronto but are rarely seen here now. Despite the English touch of the glasses, the Imperial today has a strictly Canadian atmosphere. And one too that recalls an older Canada. When, say, the Toronto folk scene was going strong via Joni Mitchell and Ian and Sylvia in the mid-60’s, most of the beer bars – beverage rooms in the old parlance – looked like the Imperial. It is one of the few still remaining. I was thinking of all the soldiers and airmen who must have made their way through here in the last years of the war. On a late afternoon of a wan winter Sunday, 2015, the patrons were generally older, and no hipsters that I saw, but Ryerson University is kitty-corner, so I’d guess at other times a different crew come in. From Bar Volo to Imperial Pub … opposite in many ways, but they share things too. They both refresh and offer a respite from the fretful and sometimes parlous days that characterize life in the early 2000’s. And old and new can be deceiving in some ways, e.g., Volo’s building is actually older than the Imperial’s location by a generation or two. But one thing I know: we have it better than the soldiery who drank lager and ale at the Imperial in ’44 and ’45, many of them never came back or ended in hospitals. I drained the leavings in my dimpled mug in silent salute to them and their like today who hold us harmless from the inevitable malignities of all eras. After that I entered the subway and came home. Note re blackboard image: drawn from Bar Volo’s website. Will Hard Soda Create Good Feelings? This might be my fave post to date. (And that’s saying something.) I read it twice. I can almost see the duo from the classic film ‘Goin’ Down the Road’ necking back a pint at the Imperial! Thanks Sean! Happy New Year. That group of legal friends I’m part of is planning its quarterly (or so) conclave next at Imperial, you’ll have to join us. I’ll let you know.